I’m always so busy doing and making stuff for other people that I seldom make or do anything ‘just for me’. And when I DO keep something that I made, it’s usually only because it has a flaw and wouldn’t sell anyhow!?!?! What is up with that??? Now that I am ‘on my way to being 60 years old’ I’ve decided to ‘do a little something nice for myself’ every once in a while. 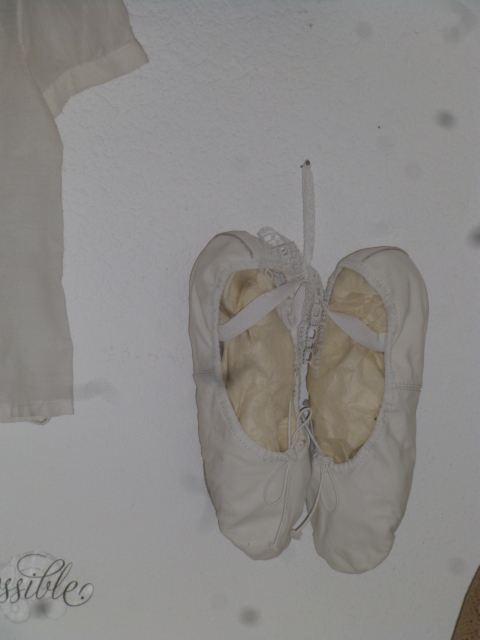 It started with these ballet slippers. They are an item that I always look for and buy (at the right price) to sell in my booths. And every time I’d buy a pair and ready them for sale, by stuffing them and tying on the price tag with a pretty ribbon; I’d secretly wish I could keep them for myself. But I just never did! I blame my mother for this affliction. This ‘you don’t deserve to have what you want’ disease of the mind. She is long gone, but her continual invalidation of me and my talents (of which she thought I had NONE, and never missed an opportunity to remind me of!) and monopolization of my life via the guilt trips she sent me on; seem to linger still. I’m working on getting over it. Shopping therapy really DOES help in this case. I recently decided to start ‘rewarding myself’ every month that I exceeded a certain sales benchmark at both malls. Last month was one such month, so I bought myself a new CLOCK! A BIG clock. A big RED clock! This baby is 34″ tall!!! I almost screeched aloud with delight when I saw it in the store, as I walked past it; and down the next aisle, looking for what it was I had gone there for in the first place. I didn’t NEED a clock. I’m a ‘clock person’. I like to have a clock ‘within a glance’ at all times, otherwise I lose track of time. (but I don’t wear a watch! Go figure?!?) And I HAVE a clock on the wall of every room in this house. Including both bathrooms. 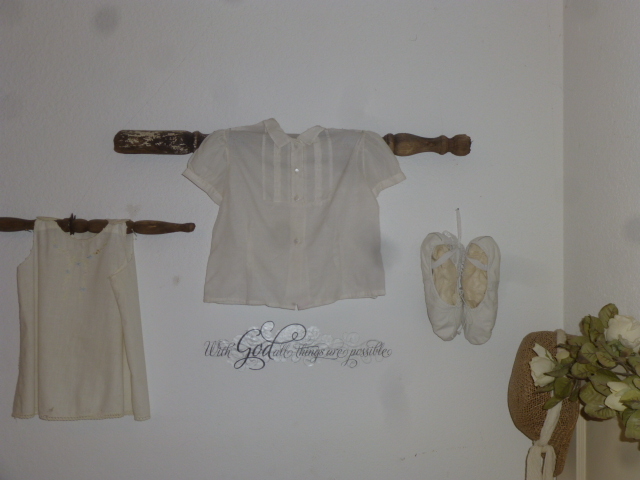 And as shown above in the living room. And if you look behind you from this spot, you can see the clock on the kitchen wall. And of course there is a clock on the stove. 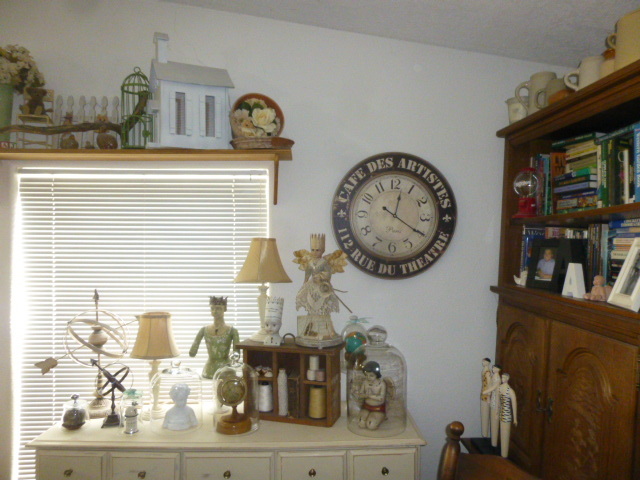 A clock in the craft room that you can see if you look to the left and one in the dining room if you look to the right; and a second clock on a dining room wall for good measure. AND alarm clocks in both bedrooms. Like I said, I’m a CLOCK person! 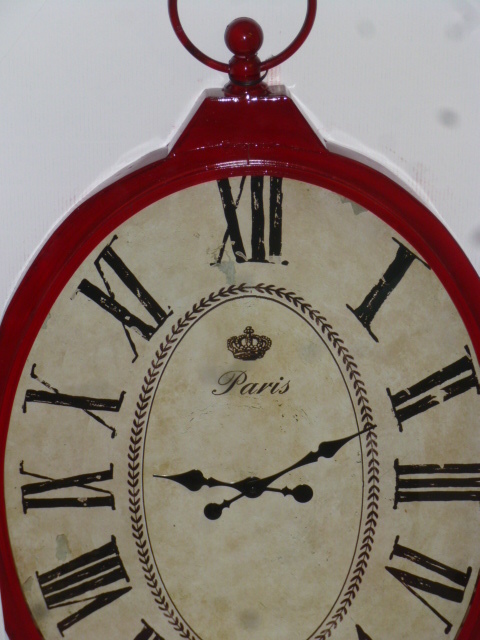 MANY of the clocks are purely functional, one came from the dollar store even. One was a thrift store find (new & still in the box!) I did NOT need another clock. 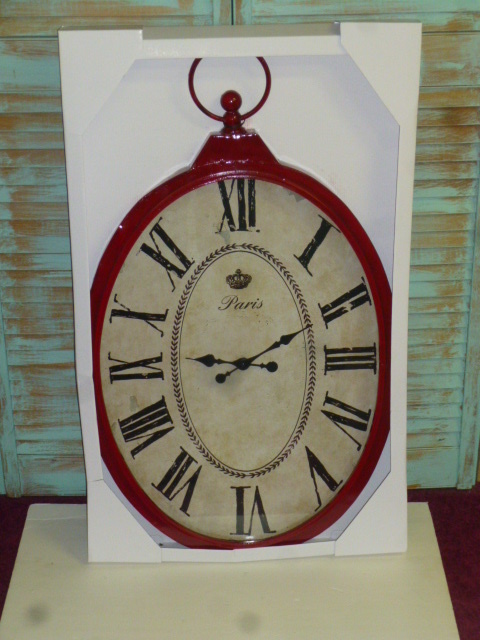 But I LOVED this ginormous RED clock!! And I DESERVE to have things ‘once in a while’ for NO REASON other than that I love and want it and it makes me HAPPY! I had to ‘give up’ one of my old clocks to make room for this one. It’s SO big and heavy that I was not even able to hang it by myself! I had to have Michael do it for me. It is now the living room clock. And when I look at it to see the time, it will make me happy. And I won’t feel guilty for being happy nor occasionally buying a little something that MAKES me happy! Look how TINY they are?!?! The ‘bumps’ on the sides are supposed to be a lion’s head. 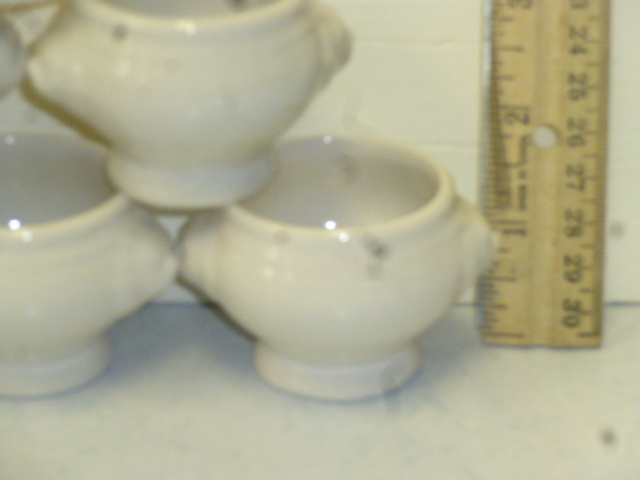 I actually have a couple of soup size bowls in this same design in my booth at Stars. 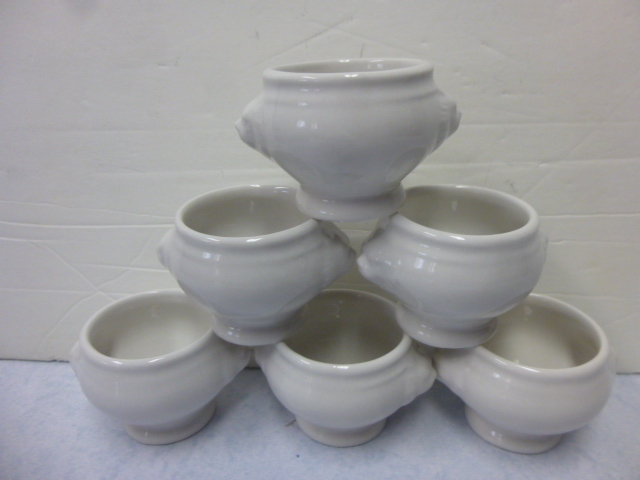 I thought about selling some of these, or bringing the bowls home to keep. But I don’t NEED any more bowls. And bowls don’t make me happy like big red clocks or tiny cute ramekins do! Your wonderful! And i look forward to getting your blogs, i love love love your RED clock. I was in portland a few weeks ago at a coin show with my husband i stayed in the hotel, i was going over the arts & crafts in craigslist when i happend apon you and your blog, ,,that i joined lol. I havent crafted in many years but thanks to your super talent i have started again, i have been trying to find things at thrift store ect to redo, okay i found stuff but — no sander lol— no saw, but i did pick up a singer serger mach cheap with the mauel still, havent pluged it in yet, so my story is this —- your mom dident know you were so good at turning things into something sombody would love to have in there home,you are my insperation and i just love your work and your blog. 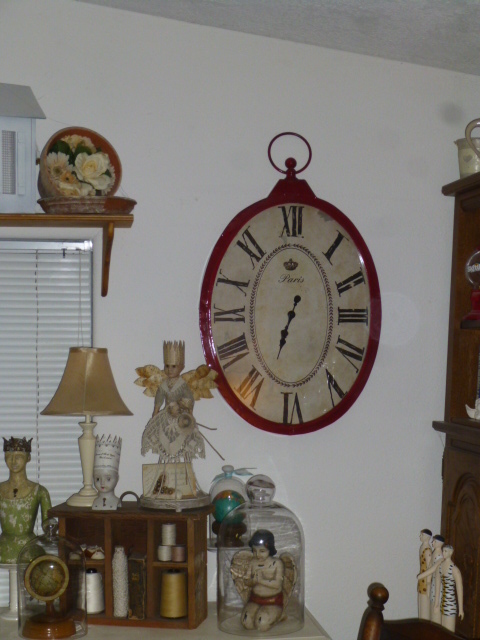 everything about this post mad me happy….and i love your new red clock! Good for you! 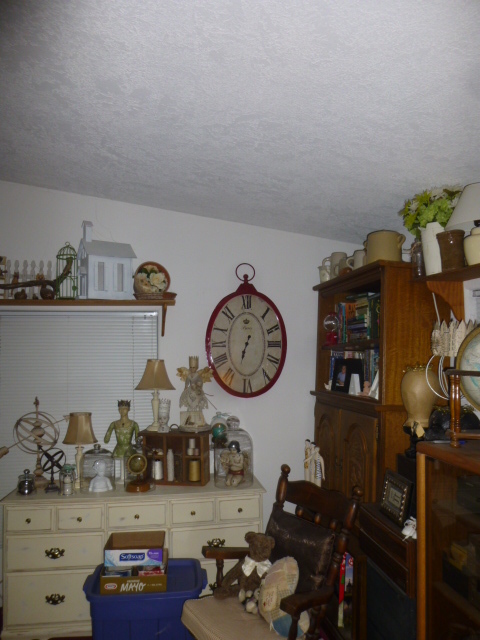 I, too, find it hard to resist clocks, and have one in every room – from where I’m sitting now I can see two! (And no, I don’t wear a watch…, so ???) I’m close to your age and wonder if it was our mothers’ generation that made it so hard for them to compliment their children (might get a “big head”) or do something nice for yourself “just because”. Glad to read you’re getting over that silly notion! Glad you are being kind to yourself. Your red clock is awesome! I wanted to tell u that I myself suffer the wrath of an invalidating mother. I do feel for u and I am so glad that u set aside times to reward yourself. I hope u reach one step further and not need a reason to reward yourself. You deserve it! U have a beautiful talent and eye for design. It’s truly an amazing talent. U should be proud. Thank u for sharing ur talents with me!